The Siberian Husky can be a difficult breed to keep if you don’t know what to expect from one. You will definitely want to familiarize yourself with some of the more common problems that are present in this breed so that you can be prepared for what may occur. Behavioural problems are best prevented, which is easier than allowing them to develop and then fixing them, which is always a much longer and gruelling process. By nature, Huskies have a high prey drive. It is in their genetics and is not something you can train out of them. A high prey drive means that Huskies will not get along with cats, small animals, or even small children in many cases. Your cats and smaller pets will be, quite literally, viewed as food to your Husky. Although some Huskies have been conditioned to get along with cats or to leave them alone, such cases are exceptions rather than rules. You would be running a risk to your other animals if you keep a Husky in the house, so it is best not to keep other types of animals with Huskies. In general, Huskies simply cannot cohabitate with cats or other smaller animals. If you have young children, you must closely supervise your Husky whenever he’s around them. Whenever your Husky tries to use teeth or tries to do anything potentially dangerous to a child in any way, you must be firm and make it clear that such behaviour is unacceptable with a “No!” It is important to supervise your Husky when he’s interacting with children at all times so that he doesn’t get away with unacceptable behaviours while you aren’t looking. It is much more difficult to train a set behaviour out of a Husky than it is to not allow it in the first place. Siberian Huskies are a working breed – they were bred to be sled dogs, which means they can run for miles each day. Their need to run means that they require a huge amount of exercise daily. A simple walk will just not suffice with this breed; a good run or even a brisk walk is necessary at the very least to tire out a Husky. Do not skimp out on your Husky’s daily exercise requirements, as many behavioural problems develop as a result of boredom and pent up energy. If you enjoy outdoor activities, some great exercises you can do with your Husky are bikejoring, cycling, hiking or scootering. Not only will they tire out your Husky, they’re a great alternative to regular walks and add some nice variety. Siberian Huskies are excellent workers because of their high intelligence. However, they also have a stubborn and independent nature, which is what makes them such good sled dogs. This also means that your Husky can and will walk all over you if he is given the chance or if proper leadership isn’t shown. Unlike some other breeds, they are not as willing to please their owner. They are so intelligent that they may not always obey you if they don’t see any point in doing so. Always be sure to use consistent, firm training to show that you are the leader. 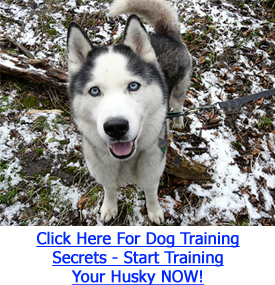 With proper training, Huskies can be excellent companions.